ORLANDO, Fla., Sept. 26, 2018 /PRNewswire/ -- Last night Microsoft presented Nintex, the global standard in process management and automation, with two 2018 Office App Awards recognizing the business value and overall impact of Nintex for Office 365. Nintex received Best Overall App first place honors for Nintex Workflow for Office 365, which recently surpassed 105 million workflow executions. 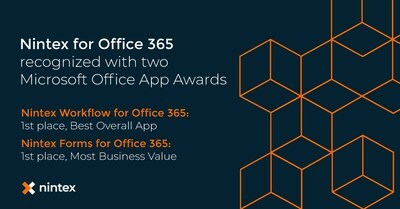 Nintex Forms for Office 365 received first place honors in Microsoft's app award category for Most Business Value. "We enjoy a rich history of helping our partners and customers turn manual and paper-based processes into efficient digital workflows and forms within Office 365 and across the Microsoft stack," said Nintex CEO Eric Johnson. "We appreciate Microsoft in helping us to deliver continued innovation through our Nintex Platform." Nintex has received various Office App Awards for its industry-leading workflow automation and forms capabilities every year since the awards were created in 2014. IT and Ops professionals turn to Nintex to quickly automate business processes in the cloud—easily connecting people, content and ecosystems including Office 365, SharePoint, Salesforce, Adobe and more. Nintex also has been recognized as a Microsoft Office and SharePoint Application Partner of the Year.